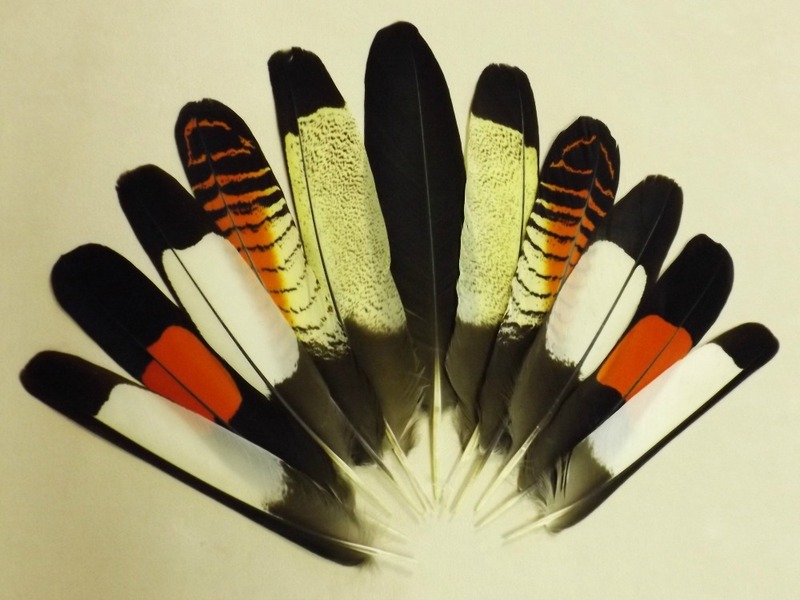 The Red-tailed Black Cockatoo tail feather is the most popular of all the black cockatoo feathers, due to it's striking contrasting colours. Female tails are like a work of art, the 'Opal' gem of the feather world. These cockatoos are owned by a number of experienced bird keepers in Australia, but like the other Australian black cockatoos the Red-tailed species doesn't exist or is very rare in other countries. There are five subspecies of the Red-tailed Black Cockatoo, from different parts of Australia. The differences between them is body, beak and crest size. Feather marking differences is also present, but only in adult females. E.G. 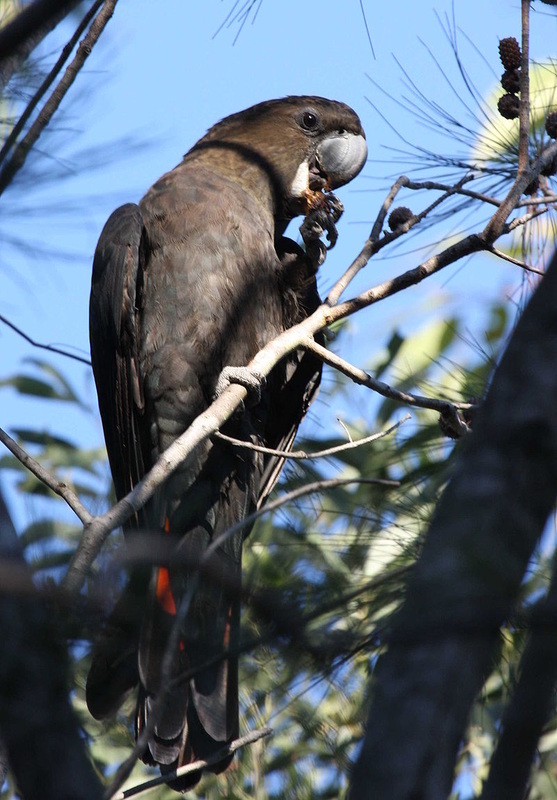 The tail feathers from the female Western Australian subspecies (Calyptorhynchus banksii naso) also know as the Forest Red-tailed Black Cockatoo has noticeably more red than the tail feathers from the Northern Territory subspecies (Calyptorhynchus banksii macrorhynchus). The male tails don't vary much (or any) in colour between the different subspecies, but only will vary in length. The Yellow-tailed Black Cockatoo tail feather is the largest and longest cockatoo tail feather. 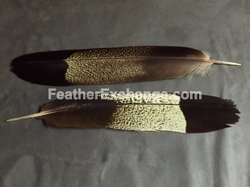 This feather can vary in shade from a bright yellow to a mid brown and the ones shed from females and juvenile males usually have dark spots. The Yellow-tailed Black Cockatoo is endemic to Australia and there are two subspecies from different parts of Australia, with the main difference between them being body and beak size. The large race of this species is one of the largest cockatoos by body size, but the longest of all the cockatoos (in the world) when including it's tail. A large tail feather from this species can be three quarters the length of a Blue-and-gold Macaw centre tail feather and that is very long for a cockatoo tail feather. Tail Sets are also available. The White-tailed Black Cockatoo tail feather is similar in size to the red tail black cockatoo tail feather. 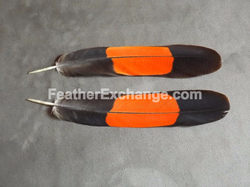 It's well proportioned shape and size makes it ideal for pow wow and hat decorating. This cockatoo is endemic to Western Australia. Like the yellow tailed species, there are two subspecies of the white tail black cockatoo. The Carnaby's subspecies is smaller, has a smaller beak and is rarer. The Baudin's subspecies is more common in its natural habitat but is still under threat due to de-forestation in Western Australia. The Glossy Black Cockatoo is a very rare species and is closest related to the Red-tailed black cockatoo. The Glossy Black cockatoo is the smallest black cockatoo and has specific requirements when in captivity. Only a handful of experienced bird keepers in Australia keep these birds and even in Australia they are very expensive to buy. This cockatoo only breeds once every two years (in the wild) and the female only lays one egg. The incubation period is longer than that of any other cockatoo. 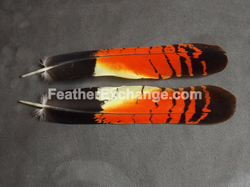 We have limited stock of these feathers, due to the rarity of these birds in captivity. 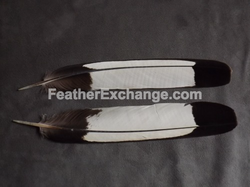 Our customers can find them amongst the Red-tailed Black Cockatoo feathers and grade for grade the Glossy Black Cockatoo tail feathers are the most valuable Black Cockatoo feathers. The tail feathers of an adult female Glossy Black species closely resembles the tail feathers of the adult female Red-tailed Black Cockatoo and male tail feathers are identical in colour and markings for both species.